It’s always fun to watch the Orchestra of the Age of Enlightenment. As members of a self-governing orchestra, and often soloists in their own right, the players like to do things their way. Come the ripe second theme of the Bruckner Adagio and the cellos were giving it lashings of vibrato; muesli-wearing adherents to pure tone be damned. So were six of the eight basses ranged across the back of the Royal Festival Hall stage. That just left two basses, left-hand fingers resolutely unmoved. They weren’t going to vibrate for Bruckner, for Sir Simon Rattle or for anybody. There are many positive aspects to this independence of spirit. The OAE members demand much of themselves and each other. They were on fine form last night, leaning with Rattle into the big tunes of this musical postcard from the year 1880, almost entirely free of the tuning slips that dogged their even later foray into the 19th century last week with Mahler’s ‘Resurrection’ Symphony. This was also a supersized OAE, and the opening Tragic Overture brought back good memories of the all-Brahms Prom they gave last year in similarly massed numbers with Marin Alsop. 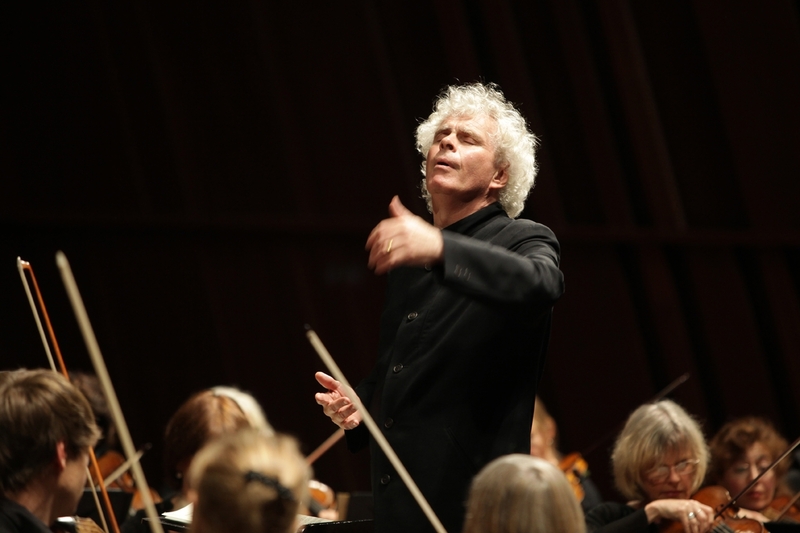 On stage with them, Rattle seems to unleash a pack of orchestral animals whose blood is up; whereas in Bruckner and Haydn over the past week he has still been controlling the sound of the LSO as a tamer and trainer. Read the rest of my review for The Arts Desk here. Posted on April 23, 2016 by Peter Quantrill	This entry was tagged Brahms, Bruckner, OAE, Rattle. Bookmark the permalink.